Going a step beyond Bible stories, this colorful book challenges children ages 5 to 8 to stop and think about the meaning of each prayer recounted. More than five dozen stories are drawn from the breadth of scripture--from "The First Prayers" of Genesis 4, through the prayers of Moses, Deborah, David, Daniel, Jesus, Peter, and Paul--and are brightly illustrated, in full color, for young readers' pleasure. 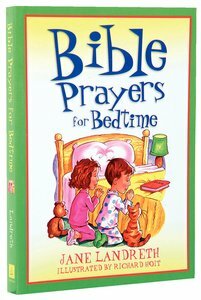 Bible Prayers for Bedtime is perfect for parents wanting to spend spiritual "quality time" with their kids--especially at this incredibly affordable price! It's an ideal follow up to Barbour's Bible Devotions for Bedtime. For spiritual "quality time" with your five - to eight-year-old children, check out Bible Prayers for Bedtime-going a step beyond the traditional Bible story book! More than five-dozen Bible prayers are included, in fun, easy-to-understand stories that your kids will love. From "The First Prayers" of Genesis 4, through the prayers of Moses, Deborah, David, Daniel, Jesus, Peter, and Paul, Bible Prayers for Bedtime explains prayer in ways that young hearts can grasp. Each chapter is accompanied by full-color illustration and design, making Bible Prayers for Bedtime an ideal book for learning and fun. About "Bible Prayers For Bedtime"
Jane Landreth enjoys touching young lives with God's love. She taught school until she gave birth to a son, then officially launched her writing career using her son's adventures for story and article ideas. She and her husband, Jack, reside in the Ozarks, where she writes for children and teaches writing for a distance-learning school.